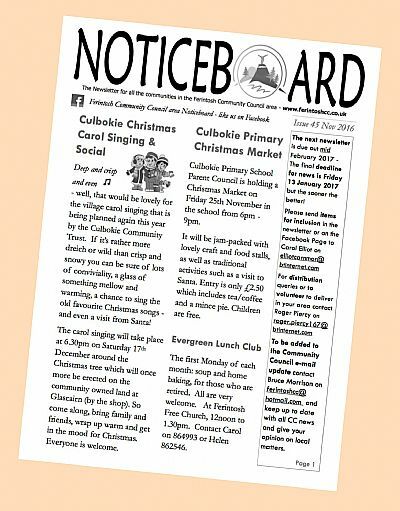 The Noticeboard is a free independently edited and distributed bi-monthly paper newsletter distributed to residents living in the Community Council area. The volunteer Editor is not a Community Councillor but one of the many volunteers living in the area supporting the Community Council on projects that benefit the community. The Noticeboard comes out mid Feb; April; June; Sept & Nov so the deadline is always mid point of the month before (to the nearest Friday). For example, for the mid Feb 2017 edition the deadline advertised is Fri 13 Jan 2017. The exact deadline date is advertised in the previous months newsletter and usually on the Noticeboard Facebook page here. To be added to the electronic distribution list or send something for inclusion in the next issue e-mail the Editor here. To volunteer to distribute the newsletter in your area/street, to start or stop getting a paper version delivered, or if you have any distribution queries e-mail the Distribution Co-ordinator here.